WASHINGTON – Amid the nation’s contentious debate over immigration –which has fueled demonstrations and allegations of racism — President Barack Obama awarded the nation’s highest military honor to a Washington-area man whose mother is African and who only became a U.S. Citizen in 2001. Only three Congressional Medals of Honor, have been awarded this year and only 3,513 since its inception in 1862. One now belongs to former Capt. Florent “Flo” Groberg, 32, who attended middle and high school in Bethesda, Md., and ran track for the University of Maryland. 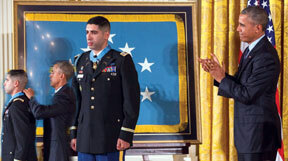 Groberg, who was born in France and became a naturalized citizen just before his graduation from Walter Johnson High School, was presented the award for saving the lives of dozens of American servicemen by foiling the plot of two suicide bombers in Kunar, Afghanistan, during his second tour. Three years ago, Groberg noticed a man acting “eery” as he and a U.S. military convoy were making their way through Afghanistan, he said on a video on an Army website describing the events. He left the formation to find that the man had a bomb strapped to his chest with a hand on the trigger. Groberg pushed the man down, but the bomb still exploded and caused the bombs of a second suicide bomber to explode prematurely. Groberg’s split second decision saved many lives and minimized the devastation, Obama said during the White House presentation. “Capt. Groberg’s immediate actions to push the first suicide bomber away from the formation significantly minimized the impact of the coordinated suicide bombers’ attack on the formation, saving the lives of his comrades and several senior leaders,” he said. Although Groberg’s actions were swift, he could not prevent the deaths of four Americans by the bombs, Sgt. Maj. Kevin J. Griffin, Maj. Thomas E. Kennedy, Maj. Walter D. Gray and Ragaei Abdelfattah, 43, a U.S. government aid worker and a former master planner for Prince George’s County. Groberg said he was honored to receive the award. “This medal belongs to true heroes, Command Sgt Griffin, Maj.Gray, Maj. Kennedy, Ra-gaei Abdelfattah who made the ultimate sacrifice and didn’t come home, and it also belongs to their families,” he said. Obama said Groberg’s training as a cross country runner probably influenced his actions. Groberg’s leg was badly injured in the attack, requiring 33 surgeries to fix it. He said he regrets that he couldn’t save the lives of his friends and that he commemorates their sacrifices and lives with a bracelet he said he seldom takes off. “It was the worst day of my life, because even though we defeated the enemy, I lost four of my brothers,” Groberg has said.